The State of Andhra Pradesh abounds in archeological remains and religious monuments. The Satavahanas of the 1st century CE left behind them many works of art, the remains of which are seen at Amaravati near Guntur. The Ikshvakus succeeded the Satavahanas and the monuments left behind by them were discovered at excavations at Nagarjunakonda.Some of the best known Buddhist monuments of Andhra Pradesh such as the Mahastupa and some Hindu temples were found in these excavations. The oldest temples in the State, Tirupati Venkateswara Temple and the Kalahasteeswara Temple date back to the pre Christian times. The Chalukyas of Badami (Karnataka) of about the 6th century built the Alampur Bhrama temples.These are excellent examples of Chalukyan art and sculpture. The Vengi Chalukyas ruled coastal Andhra Pradesh from the 7th to the 11th centuries. The Badami Chalukyas of Deccan were succeeded by the Rashtrakutas and the later Chalukyas. The Kakatiyas who succeeded the later Chalukyas and ruled from Warangal (11th - 14th century CE) constructed several beautiful temples that show a profuse display of sculptural work.. The North Eastern region of Andhra Pradesh was under the rule of the Ganga Kings of Orissa and the temples of this region show influences of the Orissa style of architecture (as in Mukhalingam and Simhachalam). The Vijayanagar Empire caused a number of monuments to be built and patronized in the State. 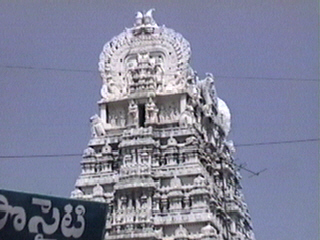 Mention must be made of the Sree Sailam temple and the ornate Lepakshi temples. The flat stuccoed granite ceilings of the Vijayanagar Empire provided a suitable background for frescoes as seen at Lepakshi. Thus, the temples that line the length and breadth of the State stand in silent acknowledgement of centuries of history and the patronage of various kingdoms such as the Cholas and Pallavas of Tamilnadu, the Chalukyas of Deccan , the Eastern Gangas and the Vijayanagar Kings. Some of these temples have been visited and sung by the Alwar (Vaishnavite) (Tirupati and Ahobilam) and the Nayanmar (Saivite) Saints (Sree Sailam, Sree Kalahasti) of Tamilnadu.